If you’re ready to tackle your closet and get organized, you may want to enlist a design professional who has the experience to guide you in your design to maximize the capability of your space. Kitchen Views recommends working with Closet Factory for your project because they have the knowledge and expertise to provide you with the best system that will work for you and your home. Currently, they are offering $500 in free accessories with your purchase of $2,500 in product. This special promotion is running through October 30, 2013. Contact Debbie Anastos, Senior Designer at Closet Factory – Call 617-620-8963 or email debbie.anastos@closetfactory.com. To receive this special discount, mention that you are a customer or an employee of Kitchen Views or National Lumber. We’d love to hear more about your project, Like us on facebook at https://www.facebook.com/kitchenviews and share your story! Creating a space that affords you the luxury of streamlining everyday tasks is an ongoing objective for most of us. With daily chores and household tasks to be done, having your living space organized will allow you to spend more time doing things you love. No one wants to get bogged down sorting through a stack of papers or spend hours looking for that something you put in a “safe place.” Have you ever hidden something in your closet for a little while, only to find it years later? That closet just may need some TLC to make it function fully for you. To get you started, grab a paper and pen to write down your ideas and answers to the next few questions. Spend some time looking at your closet. Think about where it’s located and how it’s used. Who uses the space and how often? What is stored in there? What do you need to store away for daily or weekly use? Where do you store seasonal items? Is the space used in a practical way? Or are things just piled in there? Once you read your own responses, you will have a better understanding of how that closet can be better utilized. 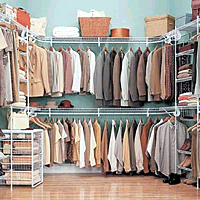 If the project seems overwhelming, you may benefit by working with a professional closet designer. 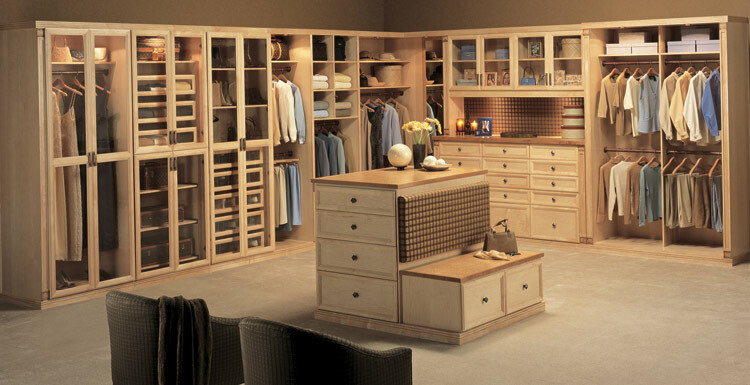 Our Kitchen Views division recommends Closet Factory for custom closet design. If you wish to work with a more economical budget, we can help with that! One of the many services we offer is installation of ventilated closet shelving systems, through our Pro Insulators division. Depending on where the closet is and how it will be used, shelving is always a must have. Whether you opt for a custom closet cabinetry system or a budget friendly ventilated shelving system, the ultimate goal is to design a space that fits your specific needs. Depending on the design and style you like, you can decide if you want to include drawers or baskets, where you want hanging rods and space for loose items and small storage. Decorative boxes and accessories can be added to store things such as hats, shoes and handbags. The fall is a great time to start a closet redesign. This time of year brings the end of summer, the start of the school year and preparations for the upcoming winter and holiday seasons. Each occasion has items associated with it that you may need to shuffle in and out of storage. Having a well-organized system will make moving things around more manageable and make more efficient use of your time. Making your spaces organized, and practicing a more streamlined life, is easier than ever, with tons of options sure to suit your individual needs. Find ideas you like and create the space to work for you. Now that you’re not spending hours looking for that gift you know you hid in the closet a while ago, what will you do?